Want to know how you can tell that Maybachs are great cars? They never come up for sale – that’s how you know. If you’re lucky enough to snag one, you keep it. In the five years or so since this site has been live, I can only recall three of them coming up for auction, this car included. We featured one of them and the car you see here had been on sale at Fantasy Junction in California for at least a few years with a price tag of $3,300,000. Wilhelm Maybach’s company and its success up to the outbreak of WWII are a direct result of flawless engineering. These were some of the best-built cars money could buy in the 1930s. 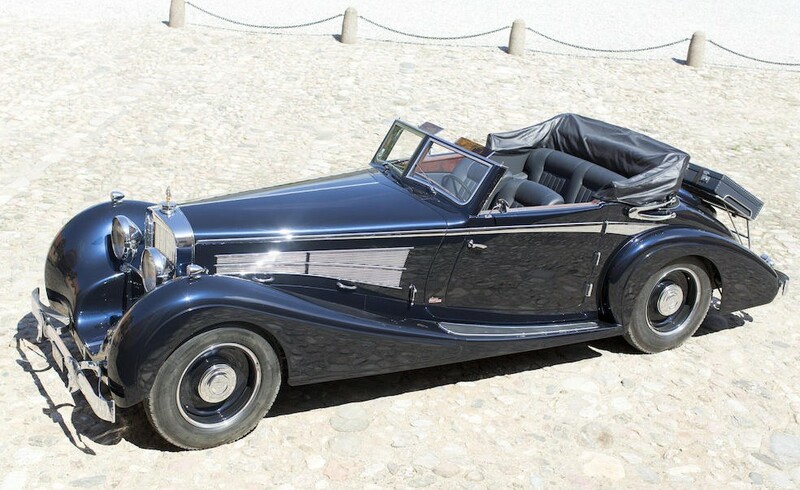 The competitors for the SW38 included the Mercedes-Benz 540K and the Horch 853A. The SW38 was the short-wheelbase Maybach and it made more power than the other two cars (you know, until you matted the accelerator in the 540K and the supercharger kicked in). This is powered by a 140 horsepower, 3.8-liter straight-six. With an unparalleled body by Spohn, this car was sold new in Germany and came stateside in 1961. It’s had a number of interesting American owners since and has been restored. The current owner acquired the car in 1999. Only 520 SW38s were built and 152 still exist – only a few are this sporty (in fact, this is one of two SW38 Disappearing Top Roadsters by Spohn). It’s a big money car, and deservedly so. Click here for more info and here for more from RM Sotheby’s. Wilhelm Maybach should be one of everybody’s automotive heroes. The quality of the engineering of his work is incredible. Born in 1846, he worked closely with Gottlieb Daimler in the late 1800s and his engines were in the first Mercedes car. He would later built giant Zeppelin engines for airships before building the cars that bore his name – some of the greatest automobiles ever built. The Maybach Zeppelin line of cars were introduced in 1928. The DS-8 form was new for 1930 and built through 1938. The engine is a large 7.9-liter V-12 making 200 horsepower. It’s a powerful car for its day and the Zeppelin was the first German car with a V-12. This car features a very ahead of its time eight-speed manual transmission. This car originally was a seven-passenger convertible limousine for heads of state. In fact, it was gifted on behalf of Adolf Hitler to a Maharajah in India. It eventually made its way back to Switzerland and was sold in 1997 to a German Maybach collector who had the state body removed and this cabriolet specially built. It’s based on a design by Spohn that they never actually built. The restoration was completed in 2005. This is a massive car in every way. The engine is huge. The car itself is almost 17 feet long. Maybach only built about 1,800 cars between 1921 and 1940 – not many of them were this grand. This car should bring between $3,000,000-$3,600,000. Click here for more info and here for more from this sale. RM Auctions no-reserve sale of the Aalholm Automobile Collection in Nysted, Denmark was one of the most awesome sales of the year, opportunity-wise. There were some obscure old cars to be had and, although they were all museum cars they were still able to bring some serious money. 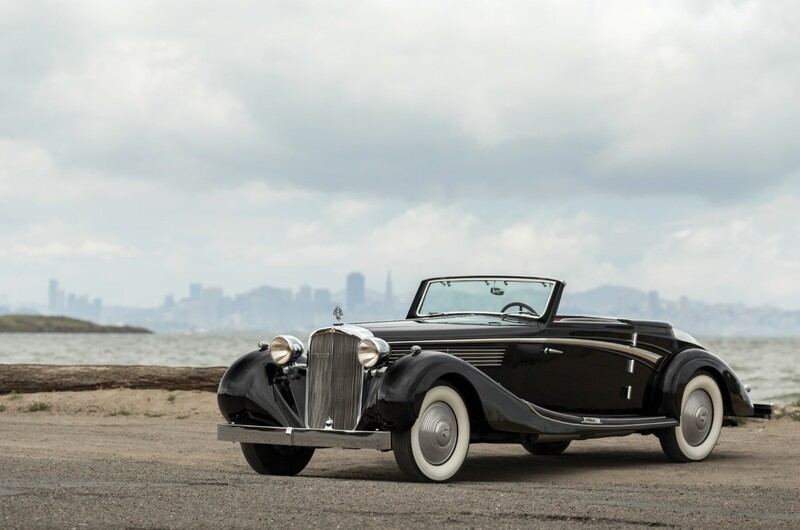 None of the cars appeared to be in concours-level condition and some were hardly better than barn finds, but most just seemed to have been sitting in their current state for years if not decades.The top sale was a 1938 Maybach Zeppelin DS8 Roadster for $1,687,000. There are also a boatload of other cars I wanted to feature, but the proximity of this sale to those at Pebble Beach precluded this. So, instead of a feature article of each of them, here’s a rundown (with photos) of the more interesting cars. First, this pair of three-wheelers. This yellow 1934 BSA Model 9 sold for $10,200. And our featured 1921 Darmont-Morgan sold for $41,700. There was also a pair of nearly-identical microcars, both license-built versions of the Isetta. First, this 1958 Trojan sold for $9,200. A couple of other German cars included this 1939 Adler 2.5-Litre Convertible by Karmann for $64,900. This 1931 DKW F1 Roadster brought $16,700. One of my favorites from this auction is this 1926 Hanomag 2/10 PS “Kommissbrot.” It sold for $27,800. This 1965 NSU Wankel Spider was one of the few post-1960 cars at this sale. It sold for $55,600. A couple of the German cars on offer were also military vehicles. The most interesting of which was this 1939 Volkswagen Schwimmwagen. It’s amphibious, although, from the photos, I’d say it might need a little attention paid to it before the new owner takes it out for a swim. It sold for $139,100. This 1940 Horch Kraftfahrzeug 15 Command and Control Car was also on the expensive side, bringing slightly less than the VW at $111,300. The final military vehicles may not have ever been used by the military at all. It was produced in the inter-war years, but in all likelihood was used by some military or other. It’s a 1926 Citroen Kegresse Half-Track and it’s awesome. It sold for $38,900. There were plenty of other French cars at this sale and many of them started with the letter ‘D.’ Like this 1904 Delahaye Surrey-Top Tourer for $111,200. Then there was a 1900 Decauville Roadster for $204,000. And this 1909 Delaunay-Belleville Belvalette for $269,000. Don’t forget the biggest of early French automakers, De Dion-Bouton, who were well represented at this sale. I really liked this 1909 Tourer for $78,800. And another French ‘D,’ the somewhat less-spectacular 1925 Donnet Type G Saloon that sold for a comparatively diddly $16,700. One of our feature cars was French, the out-of-this-world 1896 Léon Bollée. It sold for $129,800. Another unusually laid-out car is this super-rare 1902 Lacroix de Laville La Nef tyicycle. It sold for $60,200. Panhard et Levassor was also represented. Of the two offered, this 1908 Type X1 Coupe Chauffeur by Rothschild was the more impressive. It sold for $153,000. And, of course, Renault. This 1925 Type NM 40 CV Coupe de Ville by Kellner brought $278,200. And this 1903 10 CV Limousine sold for $222,500. Other cars of note included this 1911 Rolls-Royce 40/50 HP Silver Ghost Roi des Belges Tourer. It was the second-highest selling car of the auction at $871,700. This very strange (I’ve never seen one before) 1954 Arnott Lea Francis Sports sold for $55,600. American cars at this sale included this 1906 Cadillac Model M Light Touring for $70,400. There was also this 1927 Falcon-Knight Sedan for $20,400. There was a 1902 Holsman High-Wheel Runabout. It went for $48,200. And this simple-looking 1915 Metz Model 25 Touring sold for $18,500. Our other feature cars were the 1906 Ford Model N and the 1914 Benz 18/45 Four-Passenger Runabout. The Ford sold for $37,000 and the Benz $370,900. Now on to the weird stuff. We’ll start with this Russian copy of a Cadillac. It’s a 1954 Zim Limousine. It was sold in a lot of five cars, so judging what the buyer thought they were paying for this could vary on which car he/she actually wanted. But a fifth of the lot price comes out to $742. A steal. Next up is the 1905 Invisible Eight. It was not built in 1905, as it has a modern chassis and a Flathead Ford V8. It’s weird, that’s what it is. It cost $46,300. And finally, a really fun car. This 1965 Hannibal Eight Special was one of four built for the film The Great Race, starring Jack Lemmon, Tony Curtis, and a stunning Natalie Wood. The Hannibal Eight was driven by Jack Lemmon’s character, Professor Fate, throughout the movie. It sold for $77,900.